Do you want to leave your everyday life behind and enjoy your holiday in a pleasant atmosphere? Then come aboard the Princess d'Aquitaine and allow yourself to experience outstanding service in stylish surroundings. The accommodation of the Princess d’Aquitaine are all outside cabins which guarantee a great view outside of the passing scenery. 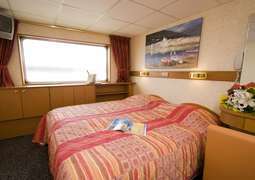 In the centre of the room you will find a comfortable double bed which can be separated into two beds and each cabin is approximately 12m2 large. On board this incredible ship you will be provided with every culinary delight you could ever wish to try. In the mornings there is a delicious breakfast buffet which offers a wide range of foods, lunch and dinner consist of a multi-course menu taken from the best of European cuisine. There are also drinks such as water, tea, beer and a selection of wines available. In the evenings there is the chance to enjoy a drink in the lounge while having a fantastic view out of the panoramic windows contained therein. There is always something to do throughout the day aboard the ship as you will discover. During the day you can explore the sights and sounds of the local area with the onshore excursions and get to learn about the culture and history. Afterwards you will have the chance to relax in the lounge or dance the night away with a nice drink (or two). One of the highlights of the trip is the Captain’s welcome followed by a Gala dinner. For the most part it is recommended that you wear casual attire but during festive events such as the Gala dinner with the Captain, more formal clothing is advisable.